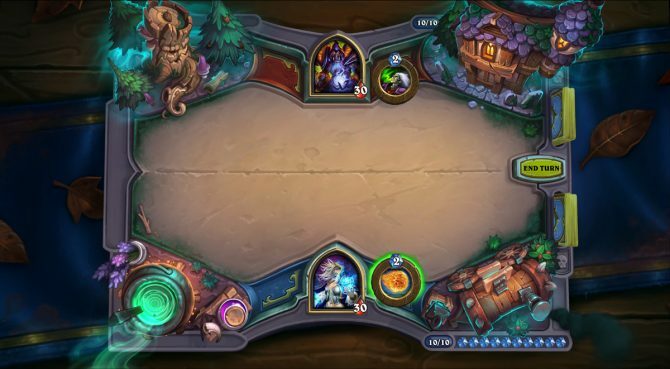 Hearthstone Game Director Ben Brode discusses new game modes, keywords, and cards from the upcoming expansion, The Witchwood. Hearthstone has had quite the journey since its launch in 2014. 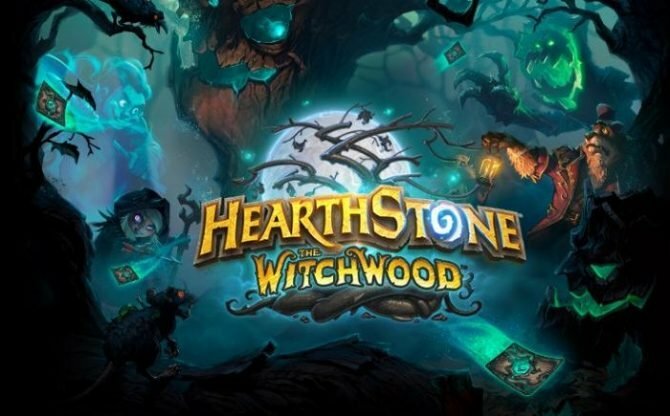 The popular card game is now in its fourth year still getting content support from the team with its upcoming expansion, The Witchwood. Adding new abilities, cards, and game modes are more than enough to reel in players new and old. At PAX East 2018, DualShockers had the chance to play the new expansion, as well as speak with Hearthstone‘s Game Director Ben Brode about the new expansion as well as the future of the Warcraft-themed card game. 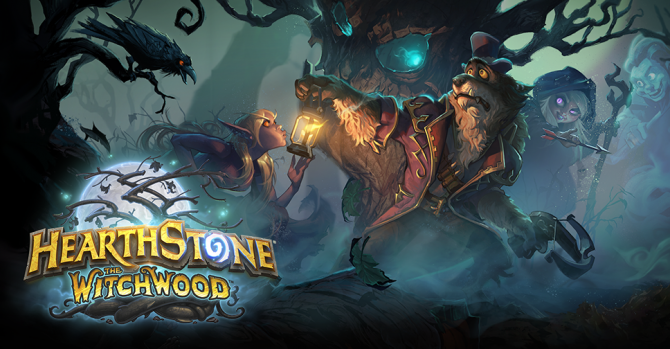 Michael: What are the new features coming to Hearthstone‘s next expansion, The Witchwood? Ben Brode: One of the things I am most excited about is the new Monster Hunt mode. It’s a totally free single player experience. Players loved Dungeon Runs when they came out in Kobolds & Catacombs; Monster Hunt takes that to the next level custom designed heroes with their own hero powers, nemeses they have to fight at the end of their runs, and they’ll all team up together in an epic boss finale against the witch of the Witchwood, Hagatha. It’s super free and really, really fun. It has a really high difficulty level, so players will have a lot of fun getting through all of these Dungeon Run encounters and I think this is going to be one of the best things to come back and play. 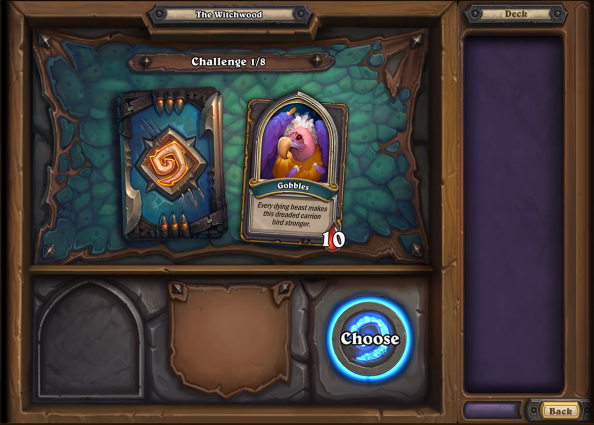 You don’t need a collection so even if you’re brand new to Hearthstone or worried about coming back, you don’t need to worry about anything except to have fun. M: In the new Monster Hunt mode, since you are going against multiple bosses, when you lose do you restart from the beginning or from the last boss you defeated? BB: It’s permadeath; you’re building up your deck, you’re making choices, you’re choosing powerful treasures for your deck along the way but if you die, you have to start all over from the beginning. It’s actually really fun because you get a new chance to see new treasures and it is pretty random which bosses you’re going to find so each run is a totally new experience. M: So each time you play, it won’t be the same bosses every time except for the end? BB: Right. In Dungeon Run, we had 48 bosses and 8 of them were shuffled together to form your run so you never know what bosses you are going to find. M: What are some of the new card abilities in the new expansion? BB: There are a couple new keywords in the set. One of them is Echo which appears on certain cards that lets you play the card as many times as you want as long as you have the mana. You can save it for the late game and play it 3 or 4 times or if you need to, play it early in the game if you’re worried about getting pressure from your opponent. That flexibility means that they are very powerful and choosing the right time to play them is really important. Another new one is Rush which means you can attack minions immediately which lets you get back into the game quickly. It’s a lot like Charge. It has all the upsides of Charge without its downsides, especially with ending the game in one turn. We are really excited about Rush. A lot of the mains in the set have Rush and are very stat-wise compared to Charge mains. M: Something I’ve always been interested about card games, in general, is how they are balanced. I feel like that process is so different than other genres. When you implement something new like The Witchwood, what do you take into account when you’re trying to balance the next expansion? BB: Well, it’s tricky. We have a team of people are very, very good at Hearthstone who are at a super high Legend level who are playing all day with all the new cards trying to get the balance perfect. It is basically impossible to get it perfect because there are so many combinations of cards, right? You can play any thirty cards together so who knows what combinations players are going to discover we never really tried. We try to have a pretty comprehensive look at things. We look at cards that do something new that is likely to combo in interesting ways. We test the fastest Rush deck and the slowest control deck; we try to test the boundaries of what is that we are doing. We do a lot of that testing, a lot of theory crafting and try to figure out what we think is going to work and how it’s going to work. Then we have the benefit of being a digital game so we can come in and change things afterward if we don’t get it exactly right. M: Do you have a general theme or vision that makes each class fun to play? BB: Yeah, absolutely. When you have 9 classes, there is going to be something that gets you excited about one class over the other. Otherwise, it’s a very hard decision to make when they’re all the same; why make a choice at all? So we have to give classes strengths but also, we have to give classes weaknesses. I think that’s one of the things that makes them interesting to play against. If you know that a rogue can’t heal, then you know that hitting that hero power as a hunter to deal 2 damage is going to stick; you hit that button 15 times and you win and you’re pretty sure of it. So you can exploit those weaknesses and try to use them to your advantage. We try to really sell the fantasy of the class with the strengths. Paladins are about taunt, divine shield, holy weapons and using consecration and things that you remember from World of Warcraft to defeat your opponents. Warlocks are about power through any means necessary. They are willing to hurt themselves to get the biggest win possible or give away their mana crystals to get more power in the form of demons. Selling these fantasies and giving classes unique things they can do is really important for a game like Hearthstone. M: Going a bit broader, recently Hearthstone celebrated the 20th anniversary of StarCraft with new in-game items. Something I’ve always wondered is could you see a game like Hearthstone set in a StarCraft, Overwatch or any other Blizzard universe? BB: It’s possible. I mean, one of the things about the Warcraft universe is it’s massive. There are infinite characters, lands, races, creature types, and storylines. So if you’re trying to release an expansion every four months, it’s ripe for making 135 cards that all feel like they belong in this world. Not that StarCraft or Overwatch are small worlds but Warcraft is just one of the biggest IP’s content-wise of all time. So it’s very easy for us to make that kind of content. I do think those kinds of games would be fun. We don’t have any current plans to do that but there’s no reason you couldn’t do that. M: Are you open to crossing universes within Hearthstone? BB: I don’t know. We did the StarCraft tavern brawl that was StarCraft inspired but still Warcraft themed. We had a tech portal, swarm portal, and a mind portal that are winks at the three variations of StarCraft. So we try to do a loose theming there to celebrate that. Honestly, I think Heroes of the Storm has got the most direct fantasy of the blending of the Blizzard universes in a way that is super fun. Hearthstone feels like it doesn’t need to go into that space. M: Going back to The Witchwood, what is your favorite card right now from the new set? 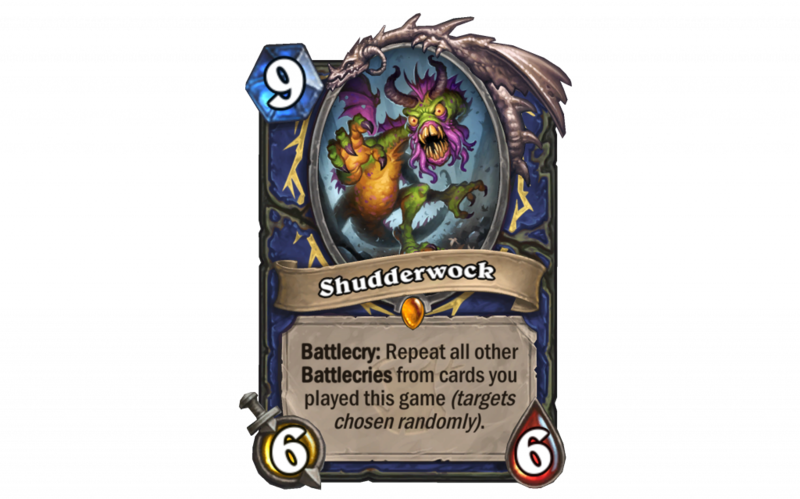 BB: I’m going to have to say Shudderwock is my favorite. It’s totally crazy. It does something that we’ve really never done before which allows Battlecries to be executed by cards other than the card the Battlecry is printed on. It makes you look at every Battlecry card completely differently. You really think about deck building in a totally different way. I think it’s one of the most exciting cards in the set. M: What are some good combinations for a card like that? BB: One of them is Saronite Chain Gang from Knights of the Frozen Throne. It says “Battlecry: Summon the exact copy of this minion.” Well, that’s pretty good on a 2/3 Taunt but it’s much better on a 6/6 so you could get multiple copies of the Shudderwok. Another crazy one is Grumble, Worldshaker which is a legendary shaman minion that says, “Return your other minions to your hand. They cost (1).” Well, if you made a copy of Shudderwok with Saronite Chain Gang and then you returned all other minions to your hand, now you’ve got another Shudderwok that costs 1 mana so you can start chaining Shudderwoks in a horrible way that is just dirty. I think there are going to be a lot of fun combos there. M: Another card you showed is Genn Greymane which says, “Start of Game: If your deck has only even-cost cards, your starting Hero Power costs (1).” Have you found an effective deck for using that? BB: That question is really fun to answer actually. Going through your collection, you can actually sort by even mana cost cards or odd mana cost cards, looking at how that combines with each class. There are really 18 new deck archetypes because there are 9 even-cost decks and 9 odd-cost decks because there are 9 classes. So figuring out which of those combinations are going to work fantastically and which cards to put into your deck to make that work is a really fun process I think players are going to love when the set comes out. M: With Hearthstone being a successful mobile and PC game, do you think you can see it on other platforms like the Switch or any other console? BB: It’s possible but right now we don’t have any plans to do that. We are already on mobile so a lot of players who have Switches also have mobile devices and they could play on those devices or tablets. There are things like you have to be online to play with players and you keep your collection online so there’s stuff that is just a little more challenging there. I love the Switch; I’m a big fan of that console. I have a Switch that I play all the time so I think everyone gets how awesome it is. I’m not sure that Hearthstone would be 100 percent perfect there. Also, we’re also servicing a lot of those players via mobile and tablet. So, I don’t know but we don’t have any current plans. M: When does The Witchwood come out? BB: April 12th! I’m excited, it’s coming right up. If you want to get familiar with Hearthstone before the next expansion launches, it is available now on PC, Android, and iOS devices. You can also check out The Witchwood‘s announcement trailer.